This week in the war, the fictional French schoolgirl, Hélène Pitrou, makes another entry in her journal Dans Paris occupé. The entry is dated 5 janvier 1944. As in her entry of a year earlier, she remarks that everyone is awaiting the Allied landing (D-Day) and anticipating that it will happen in the coming weeks. Hélène remarks that the Germans control all of the newspapers (Les Boches contrôlent tous les journaux) which report all kinds of rubbish: that Germany is winning on all fronts, etc. Hélène Pitrou is the creation of French writer Paule du Bouchet. 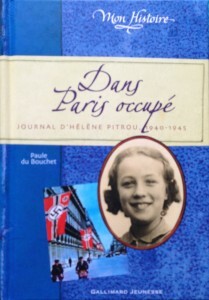 This entry was posted in Book and tagged Dans Paris occupe, Helene Pitrou, Paule du Bouchet. Bookmark the permalink.